At the 5th Biennial Conference of the International Society for Bipolar Disorders, H. Sugawara and colleagues reported on a particular example of epigenetics, an emerging field that studies ways that events and substances in the environment affect the structure of DNA. Often methyl or acetyl groups attach to DNA, making it easier or more difficult to transcribe. Sugawara’s group discussed hypermethylation of the serotonin transporter gene in bipolar disorder in an analysis of monozygotic twins discordant for bipolar disorder. 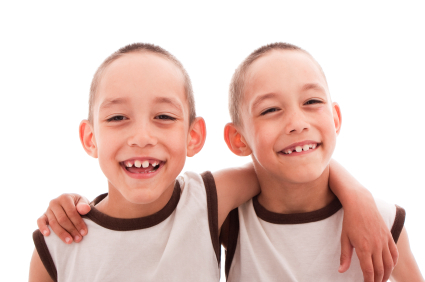 Monozygotic (identical) twins are highly concordant for bipolar disorder, meaning if one has the illness the other is likely to, but this does not occur 100% of the time. Thus, environmental or epigenetic mechanisms could account for the lack of genetic transmission of the illness in the odd cases in which one twin does not develop the illness. Sugawara’s research group found that DNA hypermethylation of the allele encoding the serotonin transporter occurred in the twins with bipolar illness but not in those without. Once the expression of this particular gene had been identified as a difference between twins with and without bipolar disorder, the researchers examined the gene in non-twin patients with bipolar disorder compared to healthy controls and confirmed that people with bipolar disorder were more likely to have the hypermethylated allele. The researchers believed that carrying a short form of the serotonin transporter was associated with DNA hypermethylation, and they went on to study the expression of mRNA for the transporter in bipolar patients carrying the short form of the allele. They found that DNA methylation was also higher at the serotonin transporter site in postmortem brains of bipolar patients. Editor’s Note: This study provides one of the first insights into possible environmental mechanisms that explain why some people at risk for bipolar disorder develop the illness and others do not. Another possible mechanism for differential expression of the illness has been suggested by E.F. Torrey and colleagues, who believe that a viral infection may enter an individual’s genome and directly alter DNA sequences. The current data from Sugawara’s research group suggest the importance of further study of the serotonin transporter site in bipolar disorder and the mechanistic reasons for the DNA hypermethylation that occurs there.